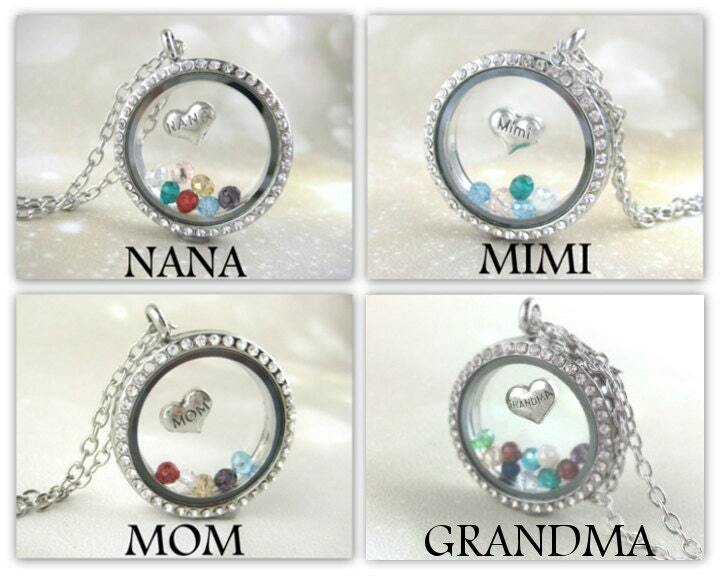 Custom Grandma Necklace features up to 20 dainty glass birthstone crystals and your choice of silver floating "Grandma" charm captured forever in a miniature crystal glass locket necklace. The locket includes your personalized birthstone color choices and your choice of a "NANA", "GRANDMA", "MIMI" or "MOM" charm floating seamlessly mid air inside the locket. 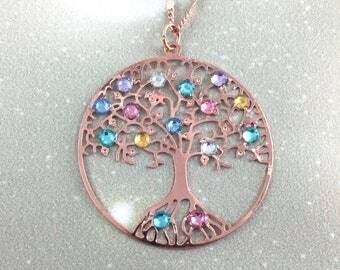 The necklace can represent grandchildren, children or any other combination of special people in Grandma's life. Each necklace is hand pieced together with great attention to detail. The Grandma necklace is part of my floating locket collection featuring beautiful glass lockets containing miniature representations of the special people, places and things we hold dear. The glass personalized grandma necklace is stunning on its own or paired with the other Grandmother jewelry and accessories available separately throughout my shop. NECKLACE OPTIONS: You may select either a "NANA", "GRANDMA", "MIM", or "MOM" floating charm with an 18inch (46cm), 24inch (62cm) or 30inch (76cm) necklace chain length at checkout. There is a photo included in the listing illustrating the different options. For more GRANDMOTHER designs, CLICK HERE! For more LOCKET designs, CLICK HERE! Just as described. Very cute packaging too:) Thanks! My mom LOVED her necklace! My mom loved it just for the mere fact that it was from her great-grandchildren.